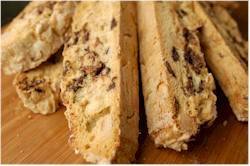 Biscotti have two distinguishing features; their long, thin, curved shape and their crisp and crunchy texture. I don't think there's a better cookie for dunking into your coffee, which is probably why you see canisters of them lining the counters of coffee shops and bakeries. For this recipe we're making Chocolate Almond Biscotti which combines chunks of toasted almonds with chunks of dark chocolate. A perfect combination. Sweet almonds are ivory-colored with a pointed, oval shape and smooth texture. They are the nutmeat found inside the pit of the dry fruit on almond trees. Almonds come in sweet and bitter forms. The sweet almonds are what most people are familiar with and used by bakers. The sweet almond, used here, has a mild, delicate flavor. I've used blanched almonds (almonds with their skins removed) which you can buy or if you want to blanch the almonds yourself; place in boiling water for about 1 minute. Drain and place in ice water to stop further cooking of the almonds. Peel the skins off with your fingers. The blanched almonds are then toasted as this really brings out their sweet flavor. The Chocolate Almond Biscotti's crisp and crunchy texture comes from baking the cookies twice, which is different from most North American cookies. Once the batter is made it's first formed into a log shape and baked until firm. We then let the log cool slightly before cutting the log into slices. The slices are baked again and this second baking draws out the biscotti's moisture making them wonderfully crisp and crunchy. It also has the added bonus of giving this cookie a long shelf life. How long you decide to bake them the second time determines how crisp and crunchy they will be. Chocolate Almond Biscotti: Preheat your oven to 350 degrees F (180 degrees C). Line a baking sheet with parchment paper. Place the almonds on a baking sheet and bake for about 8-10 minutes or until lightly browned and fragrant. Let cool and then chop coarsely. In bowl of your electric mixer, fitted with the paddle attachment (or with a hand mixer), beat the sugar and eggs on high speed until thick, pale, and fluffy (about 5 - 10 minutes). Beat in the vanilla extract. Scrape down the sides and bottom of your bowl as needed. In a separate bowl, whisk together the flour, baking powder and salt. Add to the egg mixture and beat until combined. Fold in the chopped almonds and chunks of chocolate. Transfer the batter to a well floured surface and roll into a log shape, that is about 12 inches (30 cm) long and 4 inches (10 cm) wide. You may have to flour your hands to form the log as the batter is quite sticky. Transfer the log to your baking sheet and bake for about 25 minutes or until firm to the touch. Remove from oven and let cool on a wire rack for about 10 minutes. Reduce your oven temperature to 325 degrees F (165 degrees C). Transfer the log to a cutting board and cut into 3/4 inch (2 cm) slices. Place the biscotti, cut side down, on your baking sheet. Bake for about 8-10 minutes, turn the slices over, and bake for another 8-10 minutes or until golden brown and dry to the touch. (The longer you bake the cookies the more crisp and crunchy they will be.) Remove from oven and let cool. Store in an airtight container.